Will some librarians consider it right to purge her works from library collections? We hope not. It is indeed an interesting article and perspective, and I’m glad the conversation is continuing. There is a lot in that article with which I agree. And of course, the ALSC has a perfect right to rename their award if they want to, regardless of my or anyone else’s opinion of the action! But just as James LaRue points out – accurately – that books must be taken in their entirety, and in context, so too, I believe, must actions. And I cannot help but take this action in the context of a time in our social history in which nearly every icon of our past is under attack, one way or another. The statue of Teddy Roosevelt – our most progressive President at least until his cousin FDR, and possibly until JFK – was attacked, where it stands in front of the Museum of Natural History in NYC. The very gravesite of Andrew Jackson, certainly a controversial figure but also an American President and the hero of the Battle of New Orleans, has also been attacked, and his picture on the $20 bill is to be replaced. Thomas Jefferson’s statue has been defaced on the very campus of the university (University of Virginia) he founded; here in Maryland, the statue of Francis Scott Key has been defaced, and the National Anthem he gave us attacked (completely erroneously) as racist. There are similar attacks on culture, history, and heritage going on throughout the West. I could, with a little brain-searching and research, probably come up with dozens of additional examples; these are just those that came to me with a few minutes’ thought. 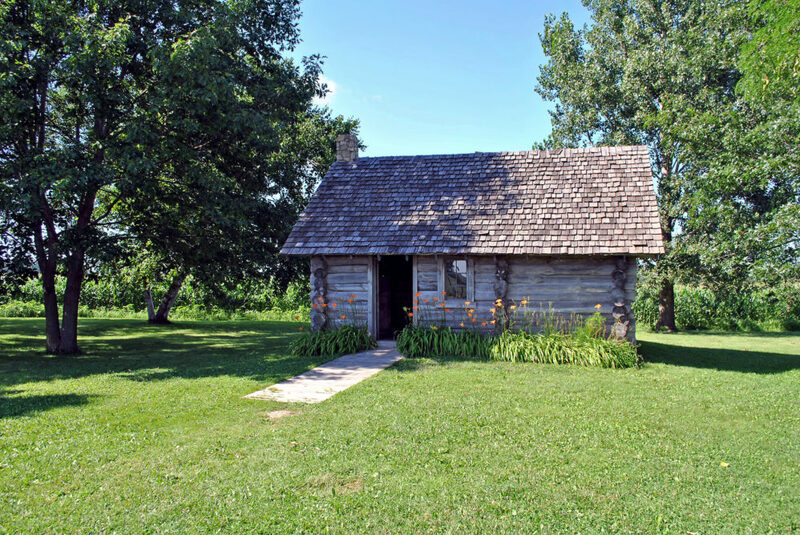 But it is within the context of these sorts of shenanigans that I interpret the decision to strip Laura Ingalls Wilder’s name from that award. Yes, the essay you linked makes some good points, and, as I say, I agree with a number of them. But it is possible to come up with good, noble-sounding, perhaps even nobly-intended, justifications or rationalizations for each and every one of the incidents I described above, and many more than I did not mention. But taken as a whole, looking at the big picture, what I see is the history, heritage, and culture of the West – indeed, Western civilization itself – under attack. Sustained, persistent, intentional. I would be fundamentally and vigorously opposed to the destruction of any culture! I am certainly opposed to the attempted destruction of my own. 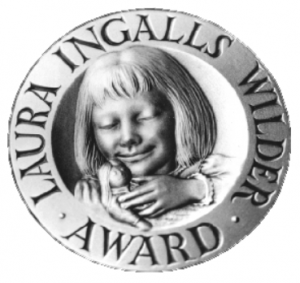 In the larger scheme of things, removing Laura Ingalls Wilder’s name from an award is not going to make or break Western civilization. But making that decision, even for the best-intended reasons, is another stone removed from the wall. Keep taking enough out, and how long before the whole structure tumbles? Pretending things that make us uncomfortable never happened isn’t going to make America better, or make American children more informed. I do not fully agree with this article, because I do not fully agree that we need to continually apologize for, or even “contextualize,” everything that occurred in our past that makes some present-day observers squeamish. But I certainly do agree with the title (“Scrubbing Laura Ingalls Wilder Is A Dangerous Step Toward Ignorance”)! To which I can only add, “give ’em an inch and they’ll take a mile”… “don’t let the camel’s nose in the tent”… whatever image you use for it, the truth remains: if you start to permit people to alter, suppress, or remove history, there’s no telling where you’ll end up. Nowhere good, that’s for certain! It started with Confederate flags, then moved to renaming schools, streets, and parks, then to removing monuments. It started with the Confederacy, but has expanded to include Andrew Jackson, Teddy Roosevelt, Francis Scott Key – even Washington and Jefferson. And in literary terms, English poets, Mark Twain and, now, Laura Ingalls Wilder. These are people who do not understand, or even try to understand, removing, altering, or destroying that which is not understood; people placing the worst possible construction on works and people which and who are complex and multi-faceted. Simplistic responses from – pardon me for saying so, but it’s true – simple minds. It is depressing and disillusioning. What has happened to this country? We used to be so much better than this! Writer and educator Annie Holmquist compares 7th & 8th grade readings lists for 1908 Minnesota with one from 2016. What she found may not surprise many readers of this blog, but it may sadden us: the idea that the curriculum has been “dumbed down” over the last century appears to be all too true. 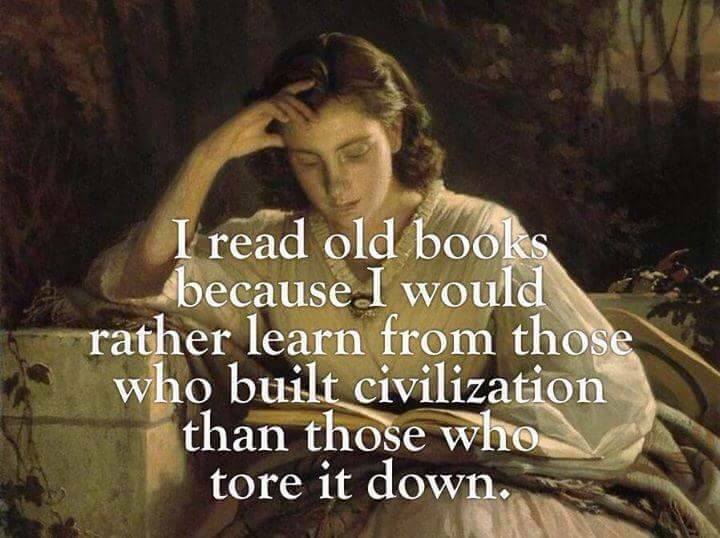 I would like to highlight her statement, quoted above, that the books on the 1908 reading list “introduce children to a vast array of themes crucial to understanding the foundations upon which America and western civilization were built,” because that is a big piece of what we have lost over the last hundred years, in my opinion. Education nowadays seems to have as one of its core values the elevation of the wonders of multiculturalism… and a subsequent, and consequent, devaluation of “the foundations upon which America and western civilization were built.” Is it any wonder that our children are graduating from grade school, and later college or university, with little knowledge and less appreciation for America, and Western civilization? And it it any wonder that the foundations, left thus untended, or even undermined, are becoming more than a little shaky? Unless we give our students challenging material to dissect, process, and study, how can we expect them to break out of the current poor proficiency ratings and advance beyond a basic reading level? Or as they say in computer lingo, “garbage in, garbage out.” That is not to say that everything our children are being taught today, literature-wise or otherwise, is garbage. But the percentage of low-quality selections is too high. As in so many other areas of life, the concern is more for making sure that students are exposed to works that are contemporary and multicultural, rather than time-tested and substantive. Anyone who is paying attention cannot help but notice an overall decrease in literacy and erudition over the past century. But what really brought it home to me was the opportunity I had, some years ago now, to pore over a stack (actually a shelf) of old yearbooks at my alma mater, the former Western Maryland College (now “McDaniel College”), that went back at least to 1912, that I recall. Some years were missing, and I didn’t have time to skim through them all, but the decline (dare I say, degeneration?) was clear to see – and particularly in the years following World War Two. The early ones were indeed erudite! And that at a level one would never even think to expect of a yearbook, nowadays. Articulate, polished, witty, and replete with plays on words and classical references, they were an embodiment of what college education used to stand for, back in the days of its glory. There hadn’t been too much slippage by my mother’s time there (she graduated in 1949), but they still weren’t quite up to the standard set by those earlier volumes. By the time of my brother’s college years (he graduated in 1975) the rot was well on – the references weren’t to classical heroes and classical philosophy, but to football, beer, and girls. But of course, college doesn’t happen in a vacuum. The seeds are sown at home, naturally, but the sprouts are tended and watered (or not) in grade school. If the early school curriculum is dumbed down, it’s no wonder that colleges and universities must spend so much time remediating that lack, to even get students up to where they can function at the “college level” – and why so many seem to have given up on academics and what used to be called “higher education,” being content to function as glorified (and expensive) trade schools. It’s really quite sad, and one of the many factors (whether symptom or cause being one of those chicken-and-egg questions that may not be wholly answerable) in our overall cultural and societal decline. If there are two institutions which have done the most to preserve, foster, and transmit Western culture and civilization over the last millennium, they are the Church and the University. If both are failing, as it appears they are – whither the West? Continuing my sequence from Sounding the Seasons, the collection of my sonnets for the church year, published by Canterbury Press, the 29th September brings us the feast of St. Michael and All Angels which is known as Michaelmas in England, and this first autumn term in many schools and universities is still called the Michaelmas term. Happy 80th Birthday to Middle Earth! As if it weren’t enough that both the traditional date of the Autumnal Equinox, and my own birthday, fall upon this date, today is also the 80th anniversary of the publication of J.R.R. Tolkien‘s classic The Hobbit, back on 21 September, 1937! My father, who was then hospitalized following a heart attack, had first The Hobbit, and then all three volumes of The Lord of the Rings, brought to him by a friend to read; as he finished one, I proceeded to devour it in turn. They have remained a major influence on me – literarily, linguistically, and philosophically – ever since! So I salute the great Professor Tolkien and his epic achievement. May he rest forever in the Undying Lands, beyond the Sundering Seas! Author The Anglophilic AnglicanPosted on September 21, 2017 September 21, 2017 Categories UncategorizedTags J.R.R. Tolkein, Literature, Middle EarthLeave a comment on Happy 80th Birthday to Middle Earth! One of the striking features of the Edina list is how recent the titles are. Many of the selections were published in the 21st century. In fact, only four of the selections are more than 20 years old. In comparison, over half of the titles on the first list were at least 20 years old in 1908, with many of them averaging between 50 to 100 years old. Click through the link and read on for more.